For 2007 only, the 1098 S is also available in an additional special ‘Tricolore’ version (red, white and green, the colours of the Italian national flag). The Ducati ‘Tricolore’ tradition began in 1985 with the stunning 750 F1 and then continued with the limited edition 851. The latest ‘Tricolore’ is a 1098 S with the additional features of frame and wheels finished in traditional ‘racing gold’ colours. In addition, a power-increasing 102 dB Termignoni racing muffler kit with dedicated ECU is supplied with the bike. Suspension is of the very highest performance standard. The fully adjustable 43mm Ã–hlins FG511 forks, which sport low friction Titanium Nitride fork sliders, respond effortlessly to every imperfection in the tarmac. Beyond their advanced engineering solutions, one of the most important characteristics of Ã–hlins forks is their ability to communicate the condition and quality of the tyre-to-road contact patch, a feature that puts every rider in superior control. The suspension system is completed and perfectly balanced by using a fully adjustable Ã–hlins 46PRC rear shock with a ride enhancing top-out spring, controlling the single-sided swingarm for outstanding drive, traction and steering precision. The Ã–hlins package is completed with a control-enhancing adjustable steering damper. The ‘S’ also sets a new standard for lightweight performance. On any sport or race bike, the most effective area to reduce weight is its “unsprung weight”. These are components like tyres, brakes and wheels. Lighter wheels have a lower ‘moment of inertia’ that is beneficial with every direction change and application of the brakes. The 1098 addresses this important area by mounting Marchesini forged and machined wheels, reducing weight by 1.9Kg (4lbs). Both front and rear are super lightweight and their benefit is immediately apparent. The weight saving is further enhanced with the application of a carbon fibre front fender. The priority in every step of the 1098 development has been performance first. Every system, every detail and every component has been studied and pared down to its essence and performance increased to the maximum. If it didn’t make the 1098 lighter, faster or deliver quicker lap times, it wasn’t considered. The result: the 1098 is the most powerful twin-cylinder motorcycle in the world with the highest torque-to-weight ratio of any sport bike. 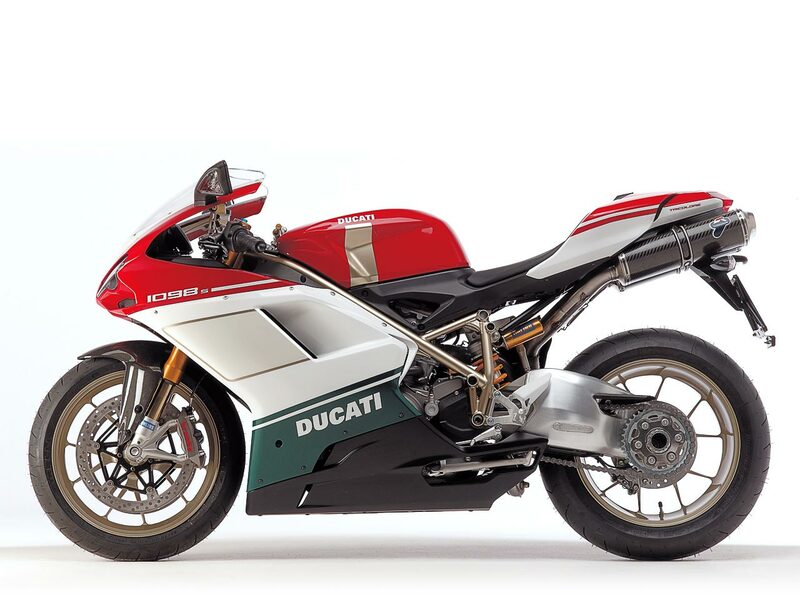 The 1098 is the lightest, fastest stopping, quickest lapping Ducati in history. For the first time Ducati MotoGP and World Superbike technology have been combined to create a premier street bike. The results are stunning. The look and stance of the 1098 were designed by the combination of race track technology, track-derived components and Ducati heritage. The 1098’s striking aerodynamic shape naturally embraces its riding position, configured by our racers and test riders for optimum speed and agility. The racing spirit takes form. The Superbike is available in three versions: the awesome 1098; the 1098 S, for those who demand the ultimate in performance with the very best suspension, lightweight wheels and components; and the special ‘Tricolore’ in green white and red – the colours of the Italian national flag – with “Racing Gold” frame and wheels, plus Termignoni racing muffler kit with dedicated ECU. With a Superbike as capable as the 1098, superior stopping power is fundamental. The 1098 is the first production street bike to use Brembo’s Monobloc caliper racing technology. The M4-34 calipers are machined from a single piece of alloy, vs. the bolt-together construction of conventional calipers. The Monobloc design has much higher rigidity and resistance to distortion during extreme braking, and therefore gives a much more precise feel at the brake lever. Desmosedici-style digital instrumentation is taken from Ducati’s MotoGP GP7 project. This pure racing, minimalist solution by Digitek has no switches or buttons to compromise its clean lines. 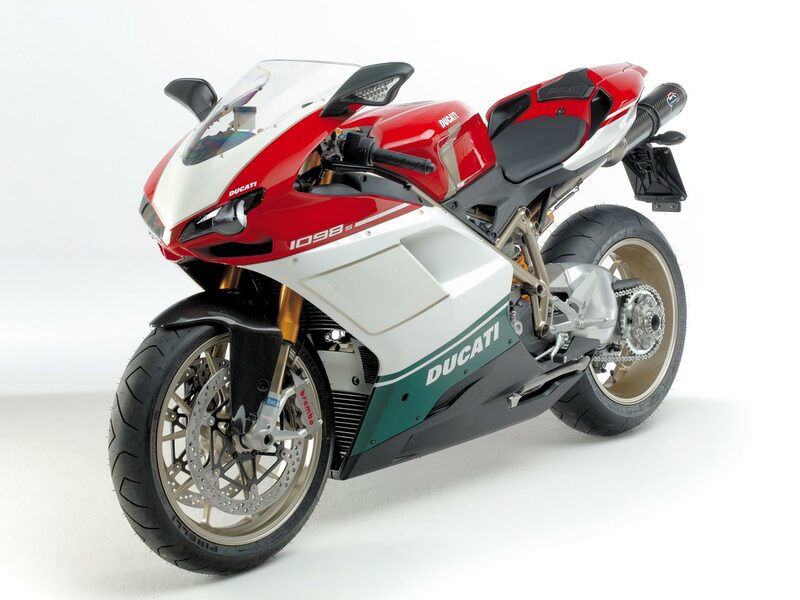 With the purchase of the Ducati Data Analyser (DDA), which includes PC software, a USB-ready data retrieval card and instructions, owners are ready to review and analyse the performance of the 1098 and its rider, and make comparisons between various channels of information. This time it was the votes of readers of two top-flight international magazines – the German publication “Motorrad” and the Italian mag “IN MOTO” – that decreed which would be the best motorcycle of 2007. Once again Ducati played a leading role, stealing the scene and winning both consensus and awards – clear indicators of the continuing worldwide success enjoyed by the latest “made in Borgo Panigale” models. This international award involves some of the most important magazines in the industry. In Italy votes were gathered by the monthly magazine IN MOTO: on Tuesday 13th March, after counting up the 24,853 ballot papers sent in to the editors, the “Motorcycles of the year 2007” were finally made known. 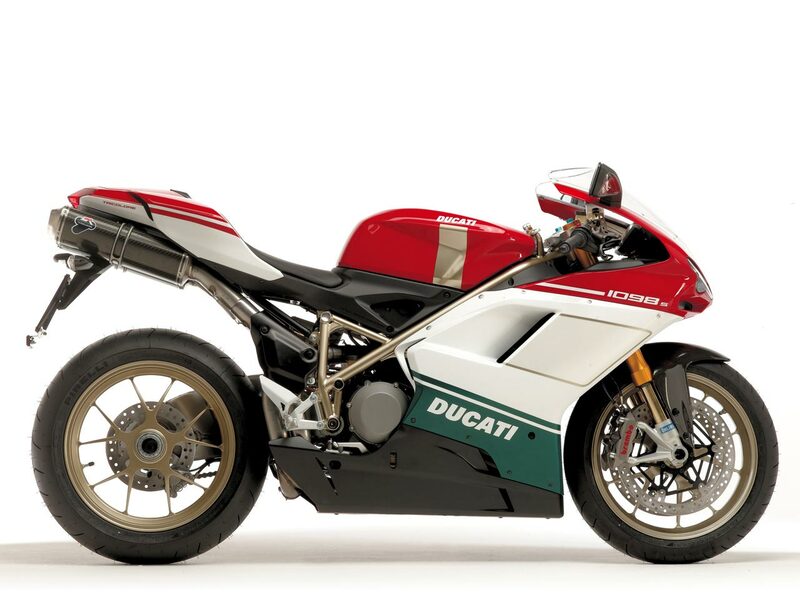 Ducati triumphed in a good three of the eight categories into which the motorcycles were divided, winning first place among the sports models (with the superbly stylish and high performance 1098 of course) with 29.9% of the vote. 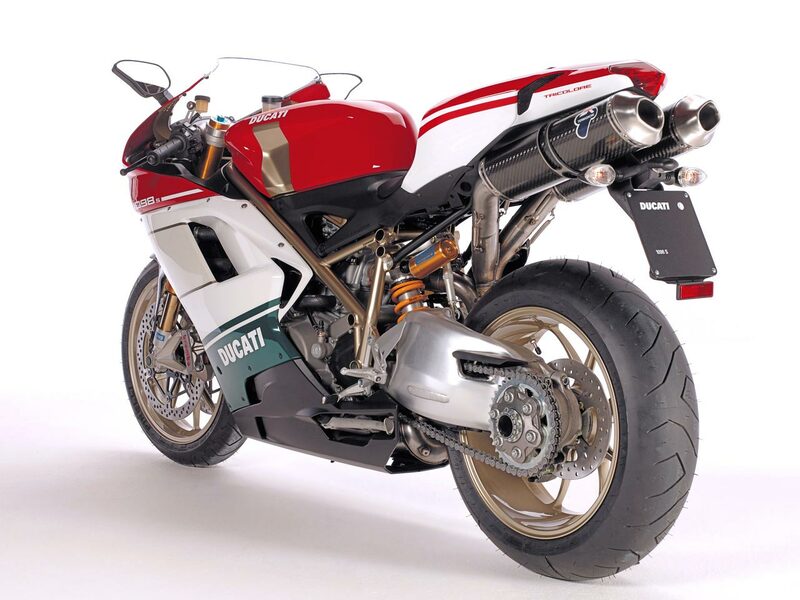 The runner-up was the MV Agusta F4 1000 R and in third place it was Ducati yet again with the Desmosedici RR, the esoteric and exclusive MotoGP road replica. The Multistrada 1100 – in the road bikes category– also came up trumps by coming first with 12% of the votes, ahead of the Yamaha FZ1 Fazer and the Moto Guzzi 1200 Sport. In the enduro/supermotard category it was a landslide victory for the all-new Hypermotard (to be launched on the market in May): sweeping aside the competition, it took a massive 33.5% of the votes, beating the BMW R 1200 GS and KTM 950 Supermoto hands down. During the night of 15th March, the renowned German magazine MOTORRAD which, with a circulation of 200,000 copies, is Europe’s most-read bike mag, also elected the best motorcycles of 2007: readers sent in a whopping 36,672 ballot papers. Once again, there were eight categories and, once again, Ducati cornered the votes. 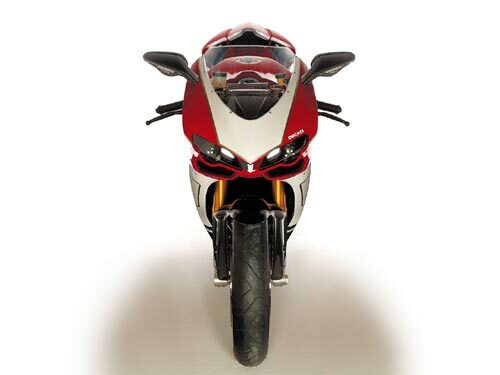 In the sports motorcycles category awards were won by two Ducatis; in first place came the 1098, with 12.1% of the vote, followed by the Desmosedici RR (11.2%). Like in Italy, it was a surprise victory for Ducati in the enduro/supermotard category where, with a percentage of 18.3%, the Hypermotard beat – playing away! – the German BMW GS 1200 (16.8 %). Acknowledged by 29% of readers as the best sports motorcycle brand, Ducati trounced the opposition in this segment, too, winning over 29 % of the readers of this authoritative German publication, who preferred the “Reds of Borgo Panigale” to Suzuki (12.2%) and Yamaha (10.1%). Instruments Digital MotoGP derived unit displaying: Speedometer, rev counter, clock, scheduled maintenance warning, warning light for low oil pressure, fuel level, oil temperature, fuel reserve, trip fuel, neutral, turn signals, average speed, average fuel consumption, remaining fuel metre, immobilizer. DDA system enabled. Exhaust Lightweight 2-1-2 system with catalytic converter and lambda probe. Twin stainless with a 102 dB Termignoni racing muffler kit in carbon fibre complete with dedicated ECU.